This recipe was given to me by a friend from Louisiana. 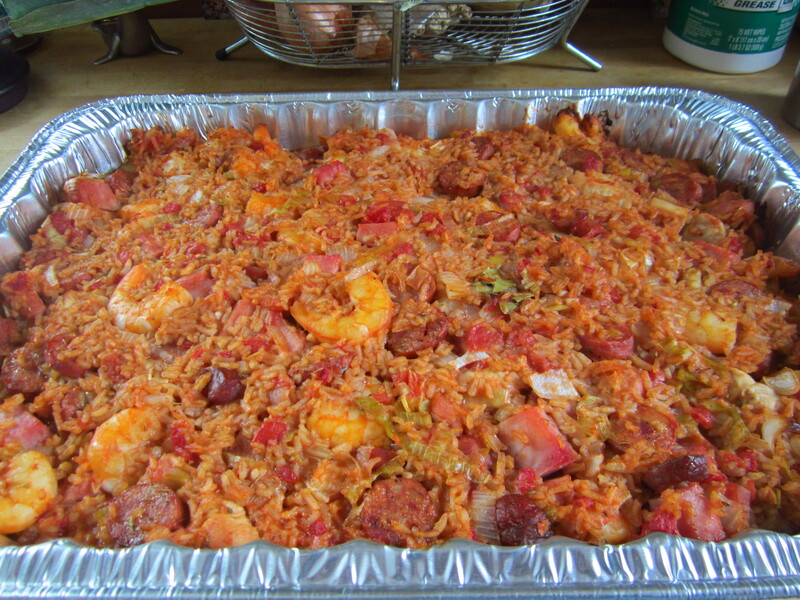 It’s a Creole version of Jambalaya (the Cajun version doesn’t have tomatoes). The recipe below fills a large roasting pan and is perfect for pot-lucks and backyard barbecues since it’s gluten and dairy-free. Prep takes a while, so give yourself at least 2 hours before serving. I cut up all my meats and peeled the shrimp. Next, dice, chop or mince all the vegetables, except the tomatoes. I saute my chicken, then add the vegetables, minus the tomatoes. While my vegetables are cooking, I go ahead and add my tomatoes and seasonings to the rice. Once the vegetables were translucent, I added them and the chicken to my rice mixture, then started cooking my other meats. After mixing all the ingredients together in my bowl, I placed it in a disposable roasting pan (I use a disposable pan when I’m taking this to an event…then I don’t need to remember to bring a pan back home) and pop it in the oven. 4 c. cooked rice (best if you only cook it so it still has a little water left). Saute the chicken in olive oil. Add vegetables minus the tomatoes and continue to saute. Add sausage, ham, and shrimp; saute until shrimp are pink. Add remaining ingredients. Mix well, then transfer to a roasting pan. Bake at 350° for one hour.